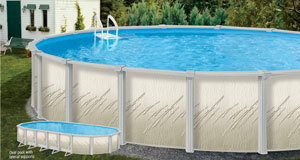 Build the perfect “staycation” with an aboveground pool by Somertime Pool & Spa Supplies, Inc.!! 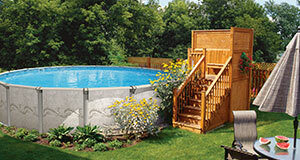 Spend time with friends and family this summer right in your own backyard with a traditional above ground pool. We offer 6 different models including the Affirma, Conquest, Element, Tamara, Nova and Summerfield with a variety of options. The Element and Tamara pools are salt compatible. 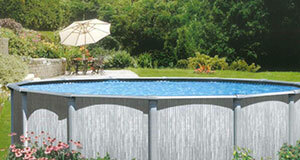 Have a splash with summer steel – an economical aboveground pool! Click Here to view the brochure. Experience the thrill of Conquest! Click here to view the brochure. Enjoy the essence of summer with the Element. With its warm colors and rich textures, the Element is an elegant and relaxing addition to your backyard. Let the Element help you indulge in the sunny weather and fresh air, and pamper you this summer as you soak up the sun in your backyard oasis getaway. Click here to view the brochure. When it is hot outside, nothing beats wading in the cool waters of your above ground pool. The Resin Series brings you innovative technology and incredible endurance that will win your heart as the ideal fusion of high technology and impeccable style. Resin injection molding is a revolutionary process that eliminates corrosion risks and guarantees long-term dependability. Transform your backyard into an everyday vacation. Click here to view the brochure. Summer is a time to enjoy quality time with your family and friends. Our swimming pools are designed to enhance your backyard enjoyment. Our High End Steel Series has been designed to integrate state of the art technology with the latest design trends. Bringing you the creation of technologically and aesthetically superior above ground pools, we bring technology and design together. Click here to view the brochure. 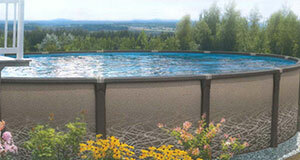 Every detail of the Summerfield pool was designed to ensure long life and lasting good looks year after year. Each component has been created using the latest technological advances and color coordinated to enhance the beauty of your backyard. Click here to view the brochure.